Director: James Strong, Euros Lyn, David Petrarca, Ali Selim, Michael Slovis, US, 2014, 432 mins (7hrs 12 mins) approx. It’s a similar story but a different country for Gracepoint as Chris Chibnall’s British detective phenomenon Broadchurch crosses the pond for its shiny new adaptation. Ready for DVD release on June 8th this 10 episode mini-series is set in a small coastal town in Northern California. Complete with dramatic cliffs and a tight-knit population, Gracepoint explores the aftermath of 12-year-old Danny Solano’s death. Do not be fooled, this is no straight forward whodunit. Look closer and this sleepy seaside beauty spot has a wealth of ugly secrets lurking just below the surface. A further dimension to all of this is the relationship of Detective Miller (Anna Gunn) and her new boss Detective Carver (David Tennant). There were some raised eyebrows amongst Broadchurch fans after Olivia Colman was passed over for Breaking Bad star Gunn, particularly given the 2014 BAFTA for Best Leading Actress in the UK original. The thing is that whilst the community cop with the homespun approach seems relatively uninteresting at first, Miller is very much at the epicentre of this disaster with the characters pivoting around her. Tennant’s Carver is the total opposite: rude, cantankerous and cold. We have, in effect, good cop and bad cop. Whilst Miller clings to a human moral compass, Carver, a hardened city cop, expects nothing less than the worst. 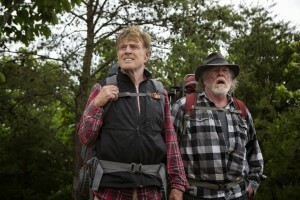 For this double-act to work, American audiences have to buy into Miller’s hard-working, sympathetic everywoman and Gunn does well to convince. Alongside this fractious coupling we have an abundance of suspicious locals ranging from the classic oddball clergyman through to the skulking old trailer park hag. Then of course there are the parents of the murder victim. Whilst their address book becomes a list of suspects, their relationship is tested to its limits and the truth begins to catch up with them. 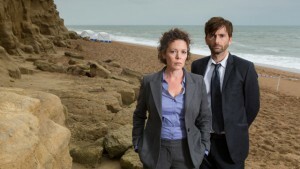 With so much competition for viewers’ attention nowadays Gracepoint, like Broadchurch, wins it well. This is no Midsummer Murders. This is next generation. Everyone has a motive, anyone could have done it and there is an emotional undercurrent rarely achieved in other attempts at this genre. Whilst there are stereotypes, such as ruthless journalist hack Renee Clemons, Chibnall keeps it realistic. By avoiding the clichéd hysterical outbursts and ridiculously sinister characters that we have become accustomed to, Gracepoint shows America a fresh way to do murder. This modern approach is revealed further in Gracepoint’s short but sweet bonus features. The best part of this extra material is probably ‘The Making Of’ where we hear from the likes of Foxcatcher scribe, Dan Futterman who lent his pen to eight episodes in the series. It turns out that despite Michael Peña’s curiosity, the cast filmed almost the entire series without knowing the culprit! For those of you who are all about the visual effects, check out the bonus on the last disk. Psst…the cliffs aren’t real! 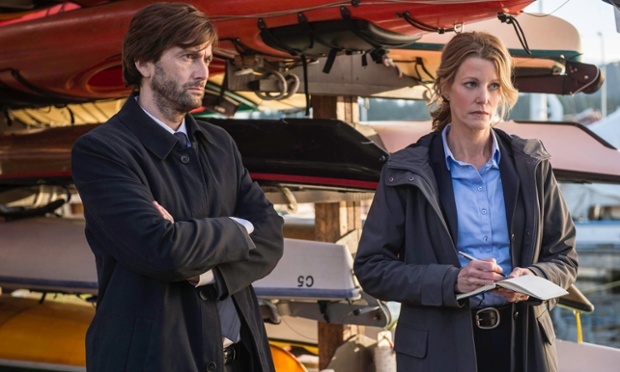 Re-boxed for American consumption, Gracepoint is yet another shining example of Britain’s growing ability to export great drama. Through Broadchurch and now Gracepoint, the Brits have well and truly reinvented the whodunit. We have finally learnt to make an extraordinary horror into an ordinary person’s crime and that, after all, is far more chilling. Another season? I think it’s a must.